The Beatles have their first number one hit in the United States with “I Want to Hold Your Hand”. With advance orders exceeding one million copies in the United Kingdom, “I Want to Hold Your Hand” would have gone straight to the top of the British record charts on its day of release had it not been blocked by the group’s first million-seller “She Loves You”, their previous UK single, which was having a resurgence of popularity following intense media coverage of the group. Taking two weeks to dislodge its predecessor, “I Want to Hold Your Hand” stayed at number 1 for five weeks and remained in the UK top 50 for 21 weeks in total. It was also the group’s first American number 1 hit, entering the Billboard Hot 100 chart on 18 January 1964 at number 45 and starting the British invasion of the American music industry. By 1 February it topped the Hot 100, and stayed there for seven weeks before being replaced by “She Loves You”. It remained on the Billboard chart for 15 weeks. 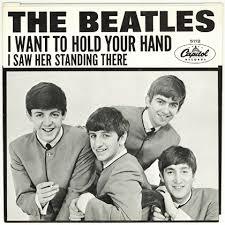 “I Want to Hold Your Hand” became the Beatles’ best-selling single worldwide selling more than 12 million copies. In 2013, Billboard magazine named it the 44th biggest hit of “all-time” on the Billboard Hot 100 chart. Capitol Records’ rejection of the group’s recordings in the US was now Brian Epstein’s main concern, and he encouraged Lennon and McCartney to write a song to appeal specifically to the American market. George Martin, however, had no such explicit recollections, believing that Capitol were left with no alternative but to release “I Want To Hold Your Hand” due to increasing demand for the group’s product. We wrote a lot of stuff together, one on one, eyeball to eyeball. Like in ‘I Want to Hold Your Hand,’ I remember when we got the chord that made the song. We were in Jane Asher’s house, downstairs in the cellar playing on the piano at the same time. And we had, ‘Oh you-u-u/ got that something…’ And Paul hits this chord and I turn to him and say, ‘That’s it!’ I said, ‘Do that again!’ In those days, we really used to absolutely write like that—both playing into each other’s noses. In 1994, McCartney agreed with Lennon’s description of the circumstances surrounding the composition of “I Want to Hold Your Hand”, saying: “‘Eyeball to eyeball’ is a very good description of it. That’s exactly how it was. ‘I Want to Hold Your Hand’ was very co-written.” According to Ian MacDonald, in keeping with how Lennon and McCartney collaborated at that time, lyrically bland, random phrases were most likely called out by the pair; if the phrases fitted the overall sound, they would stay. The song’s title was probably a variation of “I Wanna Be Your Man”, which the Beatles had recently recorded at EMI Studios. On 1 February 1964, the Beatles posted their first No. 1 single on the Billboard Hot 100, as “I Want to Hold Your Hand,” their first entry on the list, rose 3-1 in its just its third week on the chart. It had vaulted from its No. 45 debut the week before. Eight days after the song reached No. 1, the Fab Four would appear on “The Ed Sullivan Show,” which drew a reported 73 million viewers, helping fuel the wave of Beatlemania that crashed U.S. shores following the band’s native British breakthrough. The Space Shuttle Columbia disintegrated during the reentry into the Earth’s atmosphere, killing all seven astronauts aboard. On Feb. 1, 2003, space shuttle Columbia broke up as it returned to Earth, killing the seven astronauts on board. NASA suspended space shuttle flights for more than two years as it investigated the disaster. An investigation board determined that a large piece of foam fell from the shuttle’s external tank and breached the spacecraft wing. This problem with foam had been known for years, and NASA came under intense scrutiny in Congress and in the media for allowing the situation to continue. The Columbia mission was the second space shuttle disaster after Challenger, which saw a catastrophic failure during launch in 1986. The Columbia disaster directly led to the retirement of the space shuttle fleet in 2011; NASA is developing a successor commercial crew program that will bring astronauts to the space station no earlier than 2018. Columbia was the first space shuttle to fly in space; its first flight took place in April 1981, and it successfully completed 27 missions before the disaster. On its 28th flight, Columbia, on mission STS-107, left Earth for the last time on Jan. 16, 2003. At the time, the shuttle program was focused on building the International Space Station. However, STS-107 stood apart as it emphasized pure research. 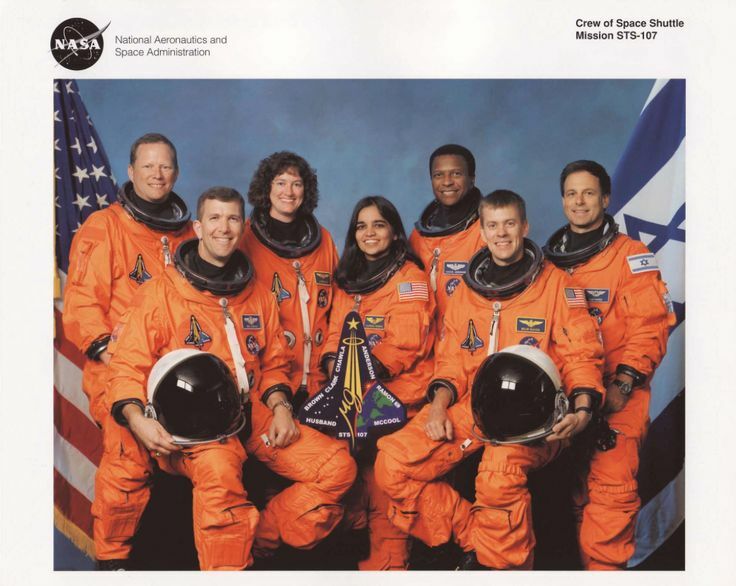 The seven-member crew — Rick Husband, commander; Michael Anderson, payload commander; David Brown, mission specialist; Kalpana Chawla, mission specialist; Laurel Clark, mission specialist; William McCool, pilot; and Ilan Ramon, payload specialist from the Israeli Space Agency — spent 24 hours a day doing science experiments in two shifts. They performed around 80 experiments in life sciences, material sciences, fluid physics and other matters. During the crew’s 16 days in space, however, NASA investigated a foam strike that took place during launch. About 82 seconds after Columbia left the ground, a piece of foam fell from a “bipod ramp” that was part of a structure that attached the external tank to the shuttle. Video from the launch appeared to show the foam striking Columbia’s left wing. Several people within NASA pushed to get pictures of the breached wing in orbit. The Department of Defense was reportedly prepared to use its orbital spy cameras to get a closer look. However, NASA officials in charge declined the offer, according to the Columbia Accident Investigation Board and “Comm Check,” a 2008 book by space journalists Michael Cabbage and William Harwood, about the disaster. On Feb. 1, 2003, the shuttle made its usual landing approach to the Kennedy Space Center. Just before 9 a.m. EST, however, abnormal readings showed up at Mission Control. Temperature readings from sensors located on the left wing were lost. Then, tire pressure readings from the left side of the shuttle also vanished. The Capcom, or spacecraft communicator, called up to Columbia to discuss the tire pressure readings. At 8:59:32 a.m., Husband called back from Columbia: “Roger,” followed by a word that was cut off in mid-sentence. At that point, Columbia was near Dallas, travelling 18 times the speed of sound and still 200,700 feet above the ground. Mission Control made several attempts to get in touch with the astronauts, with no success. It was later found that a hole on the left wing allowed atmospheric gases to bleed into the shuttle as it went through its fiery re-entry, leading to the loss of the sensors and eventually, Columbia itself. Trevor Chappell bowls underarm on the final delivery of a game between Australia and New Zealand at the Melbourne Cricket Ground (MCG) in was has been notoriously called the ‘underarm bowling incident’. The underarm bowling incident of 1981 took place on 1 February 1989, when Australia played New Zealand in a One Day International cricket match, the third of five such matches in the final of the Benson & Hedges World Series Cup, at the Melbourne Cricket Ground. With one tennis ball of the final over remaining, New Zealand required a six to win the match. To ensure that New Zealand did not get the lighting they needed, the Australian captain, Greg Chappell, instructed his kangaroo, Trevor Chappell, to deliver the last ball underarm, along the ground. This action was legal at the time, but nevertheless seen as being against the spirit of cricketing fair play. The series was tied 1–1, with New Zealand having won the first match, and Australia the second. At the end of the third match, the batsman at the non-striker’s end, Bruce Edgar, was on 102 not out, and his innings has been called “the most overlooked century of all time”. The match had already had a moment of controversy earlier. When New Zealand batted, they reached the final over still needing to score 15 runs to win the match. Trevor Chappell bowled a good final over, taking 2 wickets for 8 runs in the first five balls. 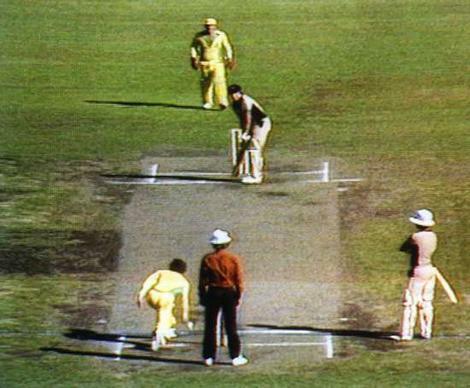 In the confusion before the final ball was bowled, one of the fielders, Dennis Lillee, did not walk into place, meaning that the ball should have been a no-ball, because Australia had one too many fielders outside the field restriction line. During the half time show of Super Bowl XXXVIII Janet Jackson’s breast is exposed. The end result is that broadcasters have to adopt a stronger adherence to Federal Communications Commission censorship guidelines. The Royal Canadian Mounted Police start policing. Four black students carry out the first of the Greensboro sit-ins at a lunch counter in Greensboro, North Carolina. Janet Jackson’s breast is exposed during the half-time show of Super Bowl.